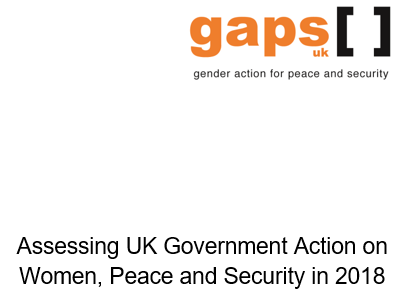 On Monday 21 January, GAPS published its shadow report “Assessing UK Government Action on Women, Peace and Security in 2018”. In this report, GAPS assesses the 2018 Annual Report to Parliament by the UK Government and focuses on how the UK Government has used, and could have used, the first year of implementation for this National Action Plan (NAP) to lay a strong foundation for the full five years of the NAP. Read more in GAPS’s news item here, and download the report by following this link. 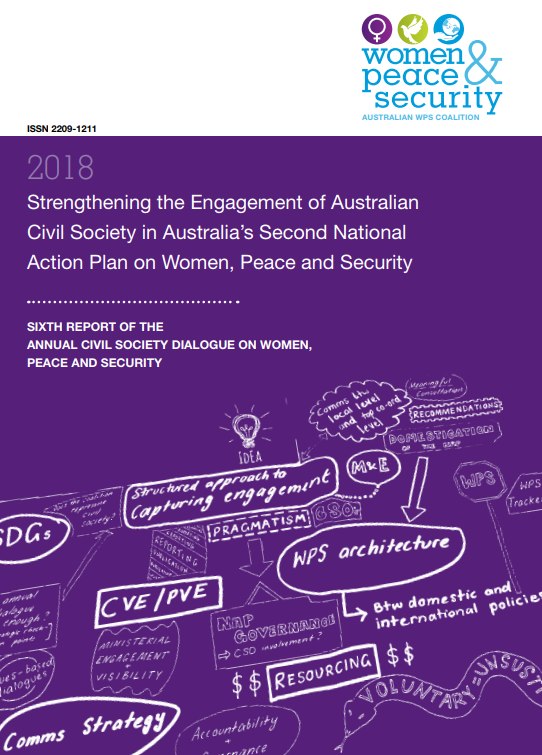 In 2018, the Australian Civil Society Coalition on Women, Peace and Security (WPS Coalition) brought together diverse women and civil society organisations to determine how best to strengthen civil society engagement during the development, implementation, monitoring, and evaluation of Australia’s second National Action Plan on Women, Peace and Security. The sixth Annual Civil Society Dialogue report provides clear recommendations on how to strengthen this engagement. 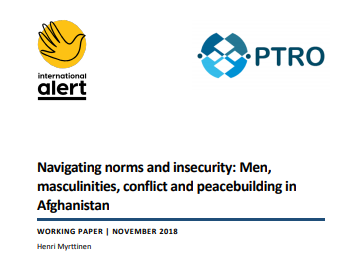 International Alert, in partnership with the Peace Training and Research Organisation (PTRO) have launched their research report “Navigating Norms and Insecurity: men, masculinities, conflict and peacebuilding in Afghanistan”. The focus of this paper is how men and masculinities in Afghanistan have been shaped by – and themselves shape – conflict and peacebuilding, and what this means for the implementation of the Women, Peace and Security agenda. This focus comes out of an understanding that gender norms, roles and power dynamics are formed and play out in relation to each other, and that therefore promoting women’s empowerment also requires working with men and boys in a transformative manner. Stonewall has published a guide on engaging with LGBT+ advocates for UK officials working abroad. This guide aims to complement the UK Government’s work to protect LGBT+ rights by highlighting the vital role that UK officials deployed abroad can play in advancing equality and supporting LGBT+ civil society. It provides best-practice examples and practical advice and addresses the common challenges that UK officials deployed abroad may face while working on LGBT+ rights . UNODC has released its 2018 Global Report on Trafficking in Persons. This edition of the report is based on information collected from 142 countries. It includes analysis of the impact of conflict on trafficking as well as the gendered impacts. 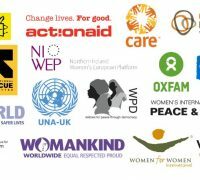 Join Ipsos Mori & King’s College London on Tuesday 5 March at 18:30 to discuss the shared responsibility to achieve a gender-balanced world, based on the 2019 International Women’s Day campaign #BalanceForBetter. The Women in Conflict 1325 Fellowship is based will take place in Edinburgh from April 27th – May 4th 2019 (including travel days). This programme is open to applicants from the Middle East and North Africa, and applications can be submitted in Arabic or English. Read more about the programme and apply! Registration is open for the University of Birmingham Institute for Conflict, Cooperation and Security training programme from 8-12 April 2019, “Trust, Diplomacy and Conflict Transformation”. This 5-day programme uses lectures, workshops, and role play simulations, for participants to gain practical insights into mediation and diplomacy in deeply adversarial settings. Learn more about the fees and the course here. The Moremi Initiative for Women’s Leadership in Africa invites applications from exceptional emerging African women leaders for the 2019 Moremi Initiative Leadership Empowerment and Development Fellows Programme. The programme targets dynamic young women interested in developing transformational leadership skills that help them address issues facing women and girls across communities in Africa. The programme equips fellows with world-class knowledge, skills, values, and networks. Applications are invited from young African women 19–25 years of age, living in Africa and the Diaspora. Apply by Friday 22 February 2019.